When a herd of a hundred Ridley Bronze turkeys gallops past, their narrowed reptilian eyes scanning the field for prey, I must confess some part of my brain stem activates and I have this strange urge to take cover in the nearest cave. They are a bit creepy when they are in pack mode. Said to be the closest living relatives to dinosaurs, maybe not so surprising that each day is peppered with scenes straight out of Jurassic Park. 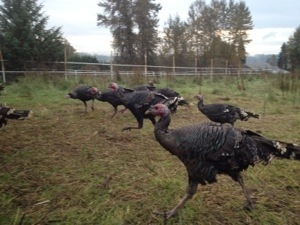 This entry was posted in Blog, Turkeys, Uncategorized. Bookmark the permalink.